The viral 10 year challenge has transformed into something unexpected. Instead of people sharing how they’ve changed over 10 years, people started posting photos of the Earth. The pictures don’t always reflect a 10 year gap: it may be 3, 5, or 100 years — but it doesn’t matter. The point is to attract attention to environmental problems, raise awareness and mindfulness, and encourage people to take actions to save our planet. Here are some of the pics Bright Side has collected for you. Don’t miss our bonus, as it contains a prediction — but shh, don’t tell anyone! The past 10 years has shown that the Rhône Glacier is rapidly melting. It has shrunk 131 feet (40 meters) since 2008. To save it, the Swiss government decided to start covering the area with UV-resistant white blankets. Experts believe this will help to reduce summer ice melting by up to 70%. The Amazon region is seriously suffering from deforestation. Between 2017 and 2018 about 3,050 square miles (7,900 km²) of the forest were cut down — most illegally. Climate change leads to massive coral bleaching, caused by algae “leaving” the coral polyps. This leads to coral starving and if the algae don’t return, to their eventual death. This, in turn, may affect around 25% of ocean species, as corals provide shelter to hundreds of thousands of crustaceans and other creatures. This challenge doesn’t just depict environmental problems. People living in areas like Sana’a, with constant conflict happening around, show how beautiful their cities were and how drastically they were affected by the events that have taken place over the years. Alaska is probably a region that suffers from global warming more than others. The increased level of carbon dioxide has led to a temperature rise, making ice melt earlier in the season than usual, and leading to glacier shrinking. Additionally, studies show the Arctic sea ice loses 3.7% of its volume every 10 years, and the surface temperature of the Arctic sea was 7.2º higher in 2017 than it was from 1982-2010. While this particular picture may seem to be an exaggeration, it reflects the problem pretty well. Polar bears do suffer from global warming. As summer becomes hotter and the amount of ice decreases, bears lose their main hunting tools — ice platforms — as well as their main food, seals. Decades ago the Arctic Ocean was covered with ice, even in the summer, giving the bears great hunting opportunities. In 2012, it covered 50% less of the surface and in several decades the situation may get even worse. Scientists estimate that there are around 18 billion pounds (almost 8.2 tons) of plastic that flood the ocean each year. That adds up to about 82 million tons per decade! No wonder our poor oceans look like giant trash bins. A recent expedition featuring the famous Richard Branson found that plastic has even made it to the bottom of the Great Blue Hole! As you can see, the gap between these 2 is just 4 years, and this makes the whole thing even scarier. The second shot was taken by Rich Horner who decided to enjoy a day of diving in Manta Point. Notably, Manta Point isn’t usually home to this much plastic. According to Rich and the Aquamarine Diving Site staff member Adriana Simeonova, the water was clear the day before and after filming. This means all those bags and bottles are moving with the currents at a fast pace, and no one knows where they’ll pop up the next time, if they’re not removed. 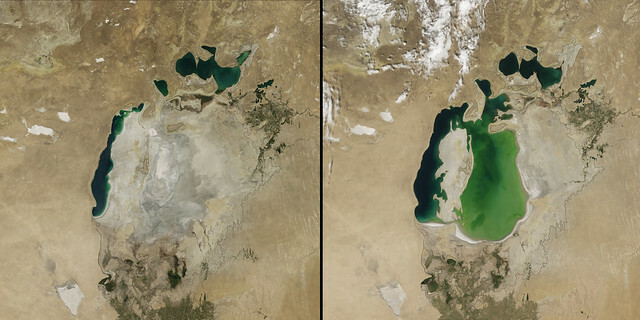 The Aral Sea is a salty lake at the border of Kazakhstan and Uzbekistan. It started shrinking in the 1960s, when the Soviet government decided to use the Amu Darya and Syr Darya rivers, which fed the lake, for desert irrigation. In 2000s, the lake divided into the Northern Sea and the Southern Sea, and in 2014 the eastern part of the Southern Sea dried up completely. The photo on the right was taken in the year 2000, and the right one — in 2014. This picture shows the consequences of palm oil farming. These plants adore warm and humid tropical climates, so rainforests are being destroyed to create space for new plantations. Palm oil farming is to blame for 47% of the total deforestation in Borneo since 2000. Thanks to global warming, the Caribbean shores of the French island of Guadeloupe are almost buried under an incredible amount of brown algae called sargassum. It all started in 2011 after the high water temperatures of 2010 caused currents and winds to change their direction, throwing tons of algae from Brazil, to the Caribbean shores. According to the experts, 2018 was the worst year so far. 12. Solar energy is thriving. There’s also some good news though! Solar Power Europe reports solar stations have become the fastest growing energy source in the world. 500 GW (Gigawatts) of solar panels have been installed as of 2019 — that’s almost 32 times more compared to 16 GW in 2009. Boschendal Farm is another source of good news. According to the WWF, 10 years brought noticeable changes. It went from dry dams and disappearing wildlife to the awakening of the land in 2018. Bonus: A daring prediction, a wish, or an action plan? Environmental issues and good news aren’t the only things you will find when looking at the 10 Year Challenge. National Geographic made up a “100 Year Challenge” and suggested the oceans could get rid of plastic by 2119. A daring prediction and an action plan that all of us can contribute to! Let’s help NatGeo’s dreams come true, shall we? So, do you agree that our planet needs some help to solve these problems? Maybe you have a plan for how to solve some of these once and for all? If you know other issues that are worth raising as part of the #10yearchallenge, don’t be afraid to tell us about them in the comments below!